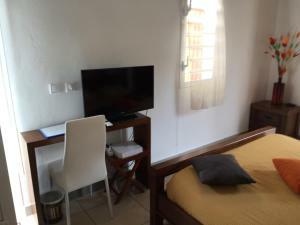 ﻿ Best Price on Appartement D'ZIL in Gosier + Reviews! Offering garden views, Appartement D'ZIL in Le Gosier has accommodations, a private beach area and a casino. Free WiFi is provided. Every unit has an equipped kitchen with an oven, a living room with a sofa and flat-screen TV and private bathroom. A microwave is also available, as well as a coffee machine and a electric tea pot. The apartment has a terrace. Guests can also relax in the garden. Sainte-Anne is 10 miles from Appartement D'ZIL, while Saint-François is 19 miles from the property. The nearest airport is Pointe-à-Pitre Le Raizet Airport, 6 miles from the property.